On November 21, 1855, Charles W. Dow, a free-state man, was shot by Franklin N. Coleman, a pro-slavery leader, near Hickory Point, Douglas County, in a dispute over a claim. Sheriff Jones, of Douglas County, arrested Jacob Branson, who lived with Dow. Branson was subsequently taken from Sheriff Jones by a group of free-state men. Sheriff Jones and approximately 1500 militia volunteers from Missouri laid seige to Lawrence, claiming there was a rebellion. By December 8, the free-state forces, led by James Lane, Charles Robinson and Lyman Allen, convinced Governor Shannon that they were only planning to defend Lawrence, not go on the offensive. 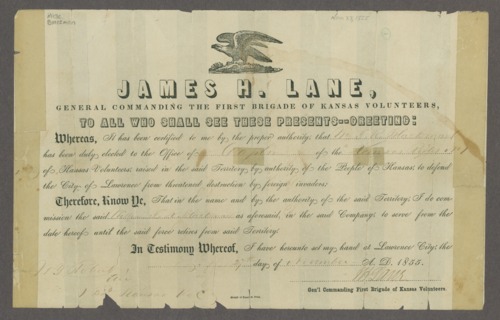 These documents, from what came to be called the "Wakarusa War," include an officer's commission and several discharges of members of the Kansas Rifles No. 1--the free-state militia--and a draft of the treaty that was signed by Lane, Robinson, and Governor Wilson Shannon to end the "war."